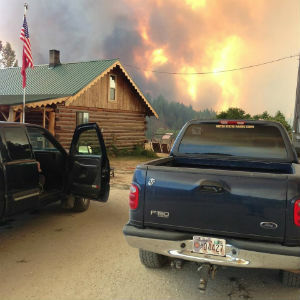 Wildfires have scorched more than 600,000 acres in Washington State alone this year. Massive infernos rage on in seventeen states, mostly out West, including the particularly hard-hit states of Washington, Oregon, Idaho, and California. Fueled by prolonged drought, these fires have forced the evacuations of thousands, destroyed hundreds of homes, and claimed the lives of three firefighters. For the first time in the state’s history, Washington has had to ask for the help of volunteers as they battle blazes beyond their control. Local churches have stepped up to help by offering space for evacuees, collecting supplies for firefighters, and rallying believers to unite in prayer. Many have witnessed firsthand the power and destructive force of these fires, as well as the opportunities for being the hands and feet of Christ. Sonya Allen, who grew up in the Church of God in Kansas and developed her faith under the leadership of Church of God Ministries’ Bob Moss—then pastor in Spokane, Washington—now lives in the mountains outside of Spokane. Her brush with these dangerous fires has taught her to rely more fully on the care and protection that only God can provide. Her first evacuation came shortly after seeing the first plume of smoke rise to the southwest. After a sleepless night in Spokane, Sonya and her husband returned to disturbing reports and sights. As the haze settled in for the evening, airplanes continued to drop fire retardant, and the only thing clear was the need to evacuate again. No one had to tell Sonya it was time to get out quickly—the wall of fire looming over the property did that. Upon return the following day, an eerie, other-worldly scene unfolded before their eyes. Ash, soot, and smoldering embers lined the roadway. Trees once emblematic of the Evergreen State were blackened and bare, if they were standing at all. All that was left of one neighbor’s home was the chimney. Making their way through a rock-cut in the road, they cautiously entered into their meadow. “The vegetation in the rock hollow was still burning, but the road was passable,” Sonya explains. “We held our breath as we emerged into our meadow, and the first thing I remember seeing was green. Everything had been black to this point, so it was very striking. Then we saw our house and realized that it, and our meadow, was still intact.” Other homes were destroyed, but their home was spared. Feelings of thanksgiving and gratitude ensued, but Sonya and her husband weren’t out of the woods yet. “I stomped and stomped. Jeff, my son-in-law, was hosing everything down around the house. What we didn’t notice were the firemen who had come running when they saw the flash and were also checking for fire. They discovered that our maple tree, not fifty feet from the house, was on fire and burning.” Those firefighters were able to put that fire out and protect the house. The real miracle, however, involved—of all things—a set of jumper cables. Sonya Allen’s life and property were protected. Many others are still being protected across the mountains of the West. Other homes are being swallowed up by the flames that continue to spread out of control. Rain and cooler weather are in the forecast for some, but not all locations. Prayers are desperately needed. Thank you for your prayers, Church of God! 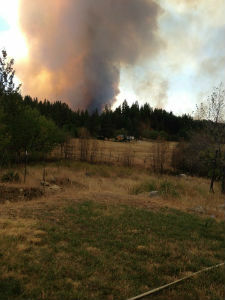 This entry was posted in All Church of God, Western and tagged Ashley Cunnington, California, Colville, drought, evacuation, fire, firefighters, First Church of God, Hucrest Community Church of God, Lifeline Church, Nate Jackson, Oregon, Pendleton, Pennsylvania, prayer, Roseburg, Sonya Allen, Spokane, Warren McMasters, Washington, West, wildfire. Bookmark the permalink.